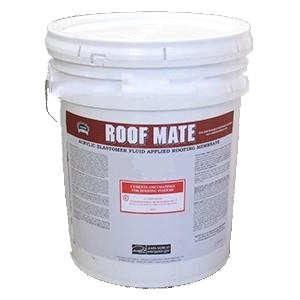 DESCRIPTION: ROOF MATE BUTTER GRADE a water-based, light-gray color, high solids elastomeric sealant with a thick, buttery consistency allows it to be easily worked into vertical seams on metal roofs, gaps in flashings and around protrusions, and into heavily alligatored areas in weathered built-up roofing. ROOF MATE BUTTER GRADE is manufactured from a unique acrylic resin specifically designed to provide increased tensile strength and elongation on problem roof areas as well. It is ideally suited for sealing mechanical fasteners and horizontal seams on metal roofs, as well as around flashings, drains and protrusions. It has excellent adhesion to asphaltic roofing, metal, concrete, wood, hypalon and polyurethane foam, and can also be used for encapsulating Roof Mate Mesh reinforcement fabric. RoofMate Basecoat - especially developed for use in embedding reinforcement fabric at detail areas and/or over the entire roof. FINISH: RoofMate cures to an attractive flat finish. PACKAGING OPTIONS: Standard in 2G and 5G. APPLICATION: All surfaces must be dry and free from dirt, dust, grease, oil, pollution fallout and other contaminants that may interfere with proper adhesion. Any primers that are to be utilized on the roof surface should be applied prior to application of any ROOF MATE BUTTER GRADE. Apply the ROOF MATE BUTTER GRADE in sufficient quantity to encapsulated fastener heads and completely seal the seam or crack being treated, extending the BUTTER GRADE 1 to 2 inches on either side of the opening. A stiff-bristle brush should be utilized for working the ROOF MATE BUTTER GRADE into seams, cracks and alligatored areas. When sealing vertical seams on metal roof decks, the BUTTER GRADE should be worked up into the seam with a brush. On horizontal metal roof seams, the BUTTER GRADE should be applied in a 3 to 4 inch strip, in 2 coats, to a total thickness of 60 to 80 wet mils, centered over the seam. All seams must first be checked to assure that there is no more than ¼" deflection when pressure is applied below the seam. Add additional fasteners as necessary to minimize panel deflection. WARRANTY: ROOFMATE HT warranties are available for five (5), ten (10) or fifteen (15) year periods. The warranties guarantee the installation against leaks caused by normal weathering. CAUTIONS: Read MSDS sheet prior to opening.